Why Does My Cat Walk on the Dog? We have a question from a reader at The Contemporary Pet website who wants to get feedback from other pet owners who have both dogs and cats under one roof. 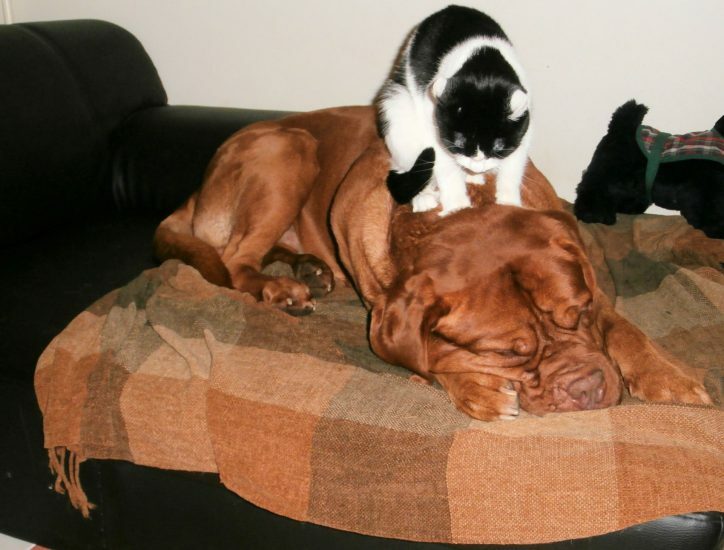 We’ve heard from several readers, most of them affirming that dogs and cats really CAN get along and they DO care for each other. Most responders who had theories on why a cat would walk on a dog agreed that it wasn’t a problem and that owners shouldn’t worry about it. Obviously, there’s no single theory on why Lynne’s cat takes a stroll on her dog in the evening, but since everyone seems to agree that it’s natural and not a cause for concern, we’ll let sleeping dogs and cats lie.